Conver. / RS-232 to RS-422 / 485 / isol. / Prot. Most industrial computer systems provide standard RS-232 serial ports. Though widely accepted, RS-232 has limited transmission speed, range, and networking capabilities. The RS-422 and RS-485 standards overcome these limitations by using differential voltage lines for data and control signals, which transparently converts RS-232 signals into isolated RS-422 or RS-485 signal with no need to change any hardware or software. 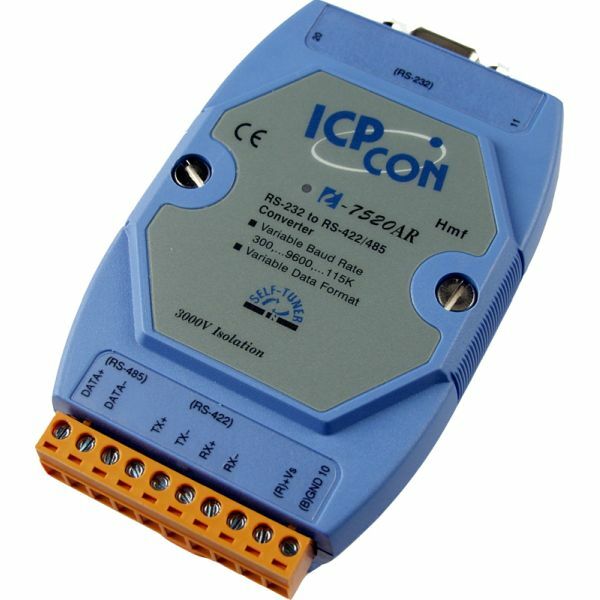 The I-7520/I-7520A lets you easily build an industrial grade, long-distance communication system using standard PC hardware. The design of the isolation between the I-7520 and the I-7520R/AR is different. If the user wants to supply power from the PLC/PC, the I-7520R/AR should be used, otherwise the isolation will be broken. Refer to the I-7000 bus converter manual for detailed information. Converter, RS-232 to RS-422/485, isol.